A perplexing property of the tafoni pattern is that uniform, seemingly homogenous rocks develop tafoni. Blackwelder (1929) discovered that tafoni form in rocks with no apparent structural or compositional irregularities like lithologic variations, fractures, or bedding planes. 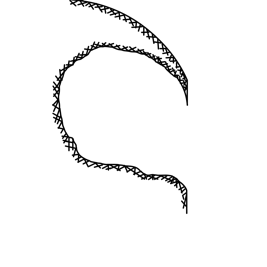 He suggested tafoni develop due to differential moistening of the rock surface and the creation of microclimatic conditions inside cavities, which cause hydration of feldspar minerals and subsequent exfoliation and removal by wind and rain. A number of researchers (e.g., Martini, 1978; Turkington 1998; Rodriguez-Navarro et al., 1999; Hacker 2003; McBride & Picard, 2004; Hejl, 2005) point to the instrumental role that microclimates and positive and negative feedback mechanisms play on a developing tafone. Positive feedback mechanisms. Tafoni interiors and the microclimates they afford promote positive feedback cycles and differential weathering of the rock. When air enters a shaded tafone and cools, it condenses moisture onto cavity walls, thereby promoting chemical and physical weathering and creating a larger surface area on which more moisture can condense, further enhancing differential weathering feedback processes. Upwards and backwards. Backwalls and roofs weather more readily because such sheltered areas are cooler and the rock surface remains in contact with the moisture for longer periods, thereby perpetuating positive feedback mechanisms. Consequently, tafoni grow “upwards and backwards” and create visors or broad overhanging margins on larger tafoni. Others have proposed a capillary moisture flux model in which visors (Conca & Astor, 1987; Conca & Rossman, 1982) and cavity walls (Mustoe, 1982) are reinforced with cementing agents derived from the rock itself; these features may form by differential cementation as well as by differential weathering. Thin section analysis of the minerals within the raised lips encircling the openings in the photograph below right reveals a higher but not statistically significant concentration of calcite in the matrix. Negative feedback mechanisms. 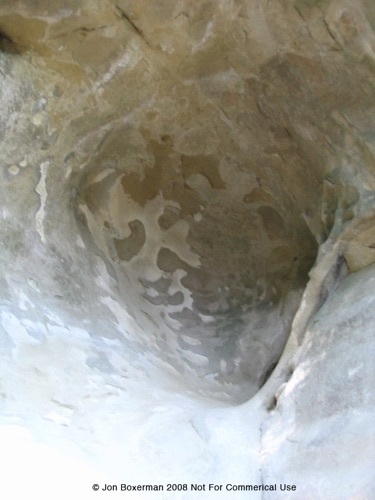 An example of a negative feedback mechanism slowing or preventing weathering is the interior of cavity walls that are reinforced with organisms or secondary mineral precipitates. 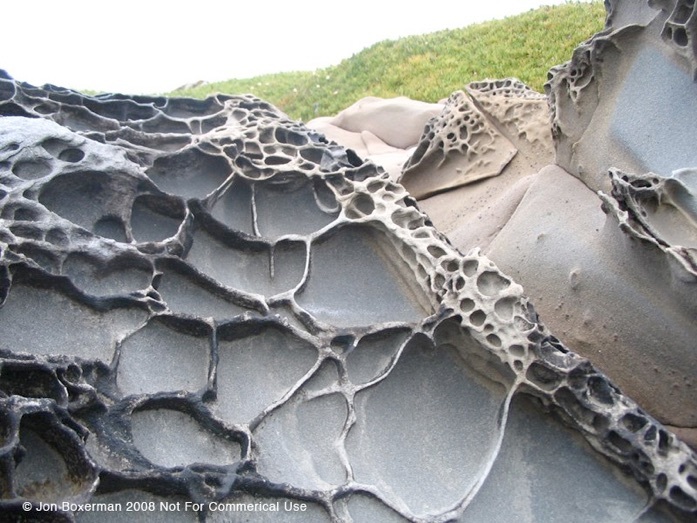 Mustoe (1982) proposed that endolithic microbes such as lichen on tafoni walls resist weathering and erosion by acting as a protective biofilm. 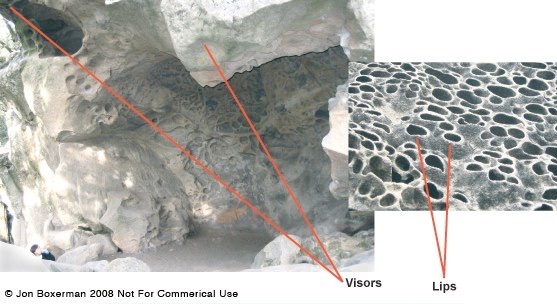 Rare time series photographs show how tafoni change over time as tafoni walls reinforced by lichen resist degradation; meanwhile, the rock surface noticeably lower around these walls. Selby (1979) proposed that desert varnish seals rock surfaces, and it is the presence or absence of this rusty-brown limonite coating that protects tafoni walls from weathering. Climate. Large and small tafoni may differ because a large tafone is voluminous enough to create a specific microclimate with “sufficiently” humid conditions to differentially weather the interior. While the weathering processes may be similar such as the growth pressure of crystallizing salt, flaking, etc., the microclimate inside a large tafone (that is, the temperature and moisture content in the air in a given 24 hour period) likely differs from smaller tafoni, which might not be able support a more constant temperature and humidity profile. Honeycombs and small tafoni might be too small to support microclimates; instead, the brevity of drying period in wetter (coastal) setting may weather cavities rapidly, preventing them from developing into large, decimeter- to meter-scale tafoni. There exists little microclimate time-series data from the interiors of tafoni (Dragovich, 1967). The extent to which temperature and humidity differences between the cavity interior and the air cause small and large tafoni growth remains uncertain. An understanding of microclimatic conditions as they relate to cavity volume and structural variation may help clarify a scientific distinction between cavernous features of different scales and the constructive and destructive differential weathering processes involved.